Skylum’s AI Lab has created a perfect “AI Triangle” feature-set with addition of a AI Sky Enhancer Filter to Luminar. The new and advanced AI Sky Enhancer Filter is going to be added to Luminar on November 1, 2018 in advance of Luminar Libraries and hence will become a serious competitor and alternative to Adobe Lightroom. AI Sky Enhancer joins Accent AI and Foliage Enhancer currently available in Luminar 2018 to create a fast and extremely powerful trilogy of AI solutions for automatic image correction. The new AI Sky Enhancer Filter will be included in the next Luminar update that will be free for all Luminar 2018 users. Use coupon code “CAMERANEWS” to save additional $10 on Luminar 2018 and Aurora HDR 2018. This filter was created for photographers who would rather focus on creating photos, and have neither the time or inclination to spend hours correcting their images. By moving a single slider you can add depth, definition, and detail to the sky without exposing unwanted artifacts or affecting any other aspect of the image. No one wants boring skies in their photos, and restoring and improving the sky is one of the most important things while creating a masterpiece. 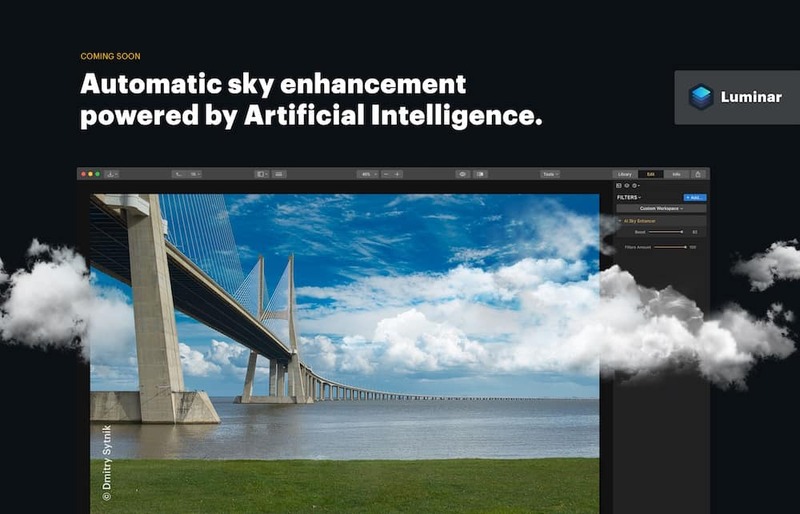 We’ve done our best to make this process as simple as it can be – the new AI Sky Enhancer creates no halos, automatically detects the edges of the sky and recognizes the sky even inside other objects such as bridges. Here are some more examples of AI Sky Enhancer in action at Skylum Blog.